Walking your pet on a daily basis can be a fun activity and something that can be beneficial for your dog as well. However, it won’t be perfect without the help of various stuff like dog collars, head halter, or a leash. When it comes to dog leashes, the highest recommended type is no doubt the retractable. In case you’re wondering, the best retractable dog leash makes sure that your pet is safe and secure while walking. Also, there’s the fact that it won’t get tangled up easily, allowing you to walk your pet or train him to be at a certain distance away from you. Needless to say, it’s important to find the right retractable dog leash which can go with a dog harness or dog head halter. We have created reviews of certain products which we believe are the best among the best to make choosing a lot easier for you. But before that, let us first talk about the benefits of using this type of leash. One of the best things about a retractable leash is that you can adjust its length depending on your needs. For example, if you’re walking your dog on an area with lots of obstacles or people, you can just shorten the length of the leash with ease. You can even shorten it so that your furry friend will stay by your side. Meanwhile, if you’re in the open field, you can extend the length of the cord to allow your dog more freedom of movement. Technically, it will all be entirely up to you to adjust its length depending on the circumstances. Recall training, or teaching your dog to come to you each time you call his name, is a really important task if you’re serious about raising your dog. After all, it can help increase his safety each time he’s outdoors. However, mastering recall training can take a lot of time. Fortunately, you can reduce the training time by letting your dog move a bit farther from you little by little, and nothing can achieve this a lot quicker and easier than a retractable dog leash. This can be done by letting your dog wander a few feet from your location and then you start calling his name. Once he returns to you after getting used to you calling his name, increase the distance that you allow him to wander far from you. Dog owners who are suffering from physical limitations can actually benefit from using a retractable leash. Although most well-trained assistance dogs are trained to obey the orders of their owners, there are still some who might be a bit uncontrollable. For this type of situation, a retractable dog leash can prove to be really helpful. Although you might not realize it, dogs also feel some sort of unease when they poop with someone standing right beside them. While you may think that they don’t really need privacy when it comes to pooping time, some dogs just can’t seem to do it when their owners are right beside them. Some dogs actually require some sort of privacy when they feel the need to poop. With a retractable leash, they can go somewhere hidden and have a more private and comfortable potty session. While you can find lots of retractable leashes on the market, each of them actually has its own set of different features. 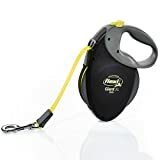 You can find some simple ones that have the essential features you’d need from a dog leash, and you can find ones with more advanced features as well. Without further ado, here are the following features you’ll have to look at when you choose a retractable leash for your furry friend. A standard retractable dog leash can have a length of anywhere between 5 to 25 feet, making it enough for almost any dog. However, if you live in a wider open field area and have managed to properly train your dog, then you might allow him more freedom of movement by going for a longer leash. Keep in mind that if you have a heavier dog, it can be a bit harder to control him at longer distances, and as such will require the best heavy-duty retractable dog leash. Needless to say, you need to maintain a firm grip on your retractable leash. You need to make sure that the one you buy comes with a non-slip handle. Also, you have to make sure that its handle is made of sturdy ABS plastic so you can properly restrain a heavy dog without it breaking. In order to make sure that you get your hands on a quality and heavy-duty retractable leash, it would be wise to invest in a product that’s made using a high-quality material. Although most leashes on the market are made of vinyl coated with plastic, most of them aren’t really that strong or durable in terms of tensile strength. That said, it’s important that you pay attention to the reviews of the customers who bought a leash before so you can ensure its longevity and durability. Going for a leash with a reflective component can be really helpful when walking your dog at nighttime. With a leash that features some reflective threading, you can be able to keep your dog safe at night, not to mention you can also track your dog easily when he’s out in the open. There are plenty of retractable leashes out there. However, we have gathered 11 of the best and reviewed them so you can have an idea of which is the best retractable leash. Flexi is a known brand when it comes to manufacturing excellent retractable leashes, and this New Classic model is just one of them. This model is made for people who own smaller dogs. As a matter of fact, it only has a 10-feet cord and is made specifically for dogs up to 18 pounds. However, you can also find medium and large versions for medium and large dogs. The New Classic model comes with a very comfortable grip and a reliable one-handed braking system. It even includes a reflective bite belt for added safety and visibility at night and low-light conditions. With its heavy-duty construction, the TUG leash is probably the best retractable dog leash for large dogs. It includes an anti-slip handle, a one-handed brake, and a 16-ft. nylon tape. Aside from that, it also allows easy movement with its tangle-free design. One of the main features of the TUG leash is its quick lock and unlock feature which lets you control it with ease. Also, its soft and comfortable handle allows you to walk your pet for hours on end with no issues about comfort. 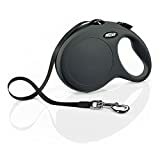 Comfort, control, and ease of use are what this retractable dog leash from TaoTronics has to offer. This leash can extend up to 16 feet, allowing you to provide more freedom of movement for your dog, especially when walking in an open field. Moreover, it has a comfortable and ergonomic handle which is easy on the hands. When it comes to durability, you don’t have to worry a lot as the casing is made of strong ABS plastic. Overall, it’s a durable, long-lasting, and weatherproof leash. The Hertzko leash is a heavy-duty retractable which is meant for use on large dogs weighing up to 110 pounds. It’s a well-made product that comes with high-quality components and other features you would normally expect from a retractable leash. Some of its features including a comfortable grip, locking metal leash connector, and a belt feeder which is designed to prevent tangling. Although it’s designed for large dogs, the Hertzko leash is pretty lightweight at only 12 ounces, making it really easy and convenient to carry. As the name implies, the Flexi Neon Leash grants high visibility at night with its reflective construction. This makes sure that you and your pup are safe when walking out at night. That aside, it is made of premium components and is specifically designed with your dog’s safety in mind. 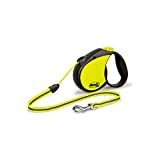 Although there are several high-visibility leashes on the market, the Flexi Neon leash is different in a way that it’s made of neon-colored components. It’s also covered in reflective stickers to capture the attention of passing drivers, which according to the manufacturer, can be visible up to 160 yards. If you plan to walk two dogs at the same time, then the WIGZI dual doggie leash is the perfect option. It’s designed to make sure you and your dogs can enjoy a tangle-free and enjoyable walking experience. Also, as it’s a dual leash, it means you don’t have to spend more just to buy two separate leashes for your dogs. Each of the leashes measures 10 feet long and can support dogs of up to 50 pounds. 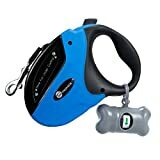 It also comes with two separate color-coded buttons which allow you to independently control each of the leashes. The URPOWER leash is a tangle-free leash that comes with a 16-ft nylon ribbon, a comfortable handle, and a break and lock mechanism. Aside from that, it’s also considered to among the most durable heavy-duty retractable leashes on the market. Its brake and lock system comes with a pause function which lets you adjust its length anytime you wish. This only means that it’s not required to lock the leash while retracting as this new function makes the entire process a lot quicker and easier. Meanwhile, its plastic casing is made of solid ABS plastic. Overall, it’s a really reliable and durable retractable leash that aims to provide you with comfort as you walk your dog. Owing to its name, the Flexi Giant tape leash is designed for the big guys. Its heavy-duty construction allows it to support large breeds who weigh up to 110 pounds. Aside from that, it can also extend up to 26 feet, making it really ideal for dogs who prefer more freedom of movement. It also comes with a reflective belt which makes it perfect for walking your dog even during nighttime. Overall, it’s a solid choice for a retractable leash for a large dog, although it’s more on the pricey side. 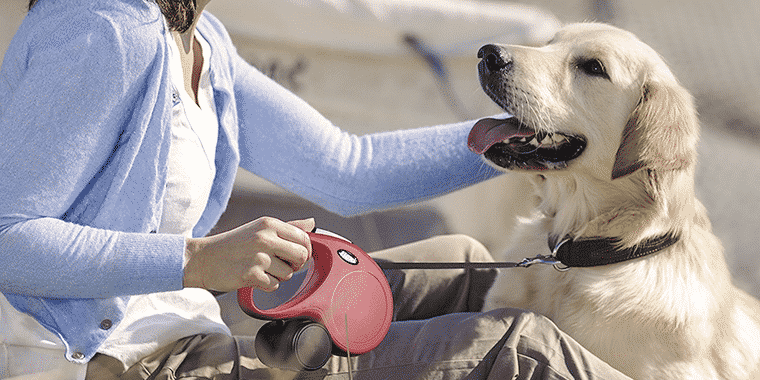 The retractable leash from Pet Neat is closely similar to that of TaoTronics when it comes to its brake and lock mechanism and its 110-pound limit which makes it ideal for use on large dogs. However, what sets it apart from TaoTronics is that it includes 4 eBooks which serve as a guide for any newbie dog owner in terms of taking good care of their furry friends. 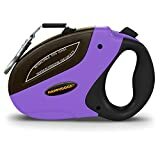 If you’re a new dog owner and are planning to buy a retractable leash for your dog, then this could very well be an irresistible deal. 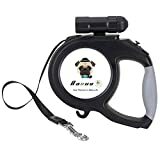 Compared to the other products on this leash, HappyDogz goes a little bit further with this retractable dog leash which is capable of supporting dogs who weigh up to 220 pounds. That said, it is a heavy-duty retractable leash which is designed for the bigger dogs. However, if you have a small or medium-sized dog, you can instead opt for the other version which is designed for dogs weighing up to 44 pounds. Feature-wise, it comes with an ergonomic handle, a tangle-free nylon lead, and a secure heavy-duty retracting mechanism. It is also capable of extending up to 16 feet long. Available in 3 different colors, the Nasus retractable leash is capable of extending up to 26 feet to provide your dog with more freedom of movement. It’s also got a brake and lock mechanism which lets you adjust its length with ease. When it comes to comfort, you can rely on its ergonomic handle grip which comes with a cushion attached on the inside. Aside from these, it even comes with a detachable 9 LED flashlight which allows you to walk your dog at night safely. Q: What length should I get? A: The answer will depend on the behavior of your dog. If you haven’t trained him using the recall method yet, then it would be ideal to go for a shorter leash as doing so will allow you to exert absolute control. Meanwhile, if you want to give more freedom for your dog, then a longer leash is preferable. Fortunately, you don’t have to worry too much about this with a retractable dog leash as you can easily adjust its length accordingly. Q: What are the dangers of retractable dog leashes? A: One of the dangers of a retractable leash is that it can malfunction over time due to wear and tear. In such a case, the cord will get stuck or perhaps refuse to retract. Another comes in the fact that its cord can cut or even burn you once it gets tangled up. For these reasons, it’s only ideal to go for the best retractable dog leash that comes with a tangle-free design to prevent such dangers from occurring. If your dog isn’t used to using a retractable dog leash yet, you might need to invest a bit more time into it. However, once you’re able to train him enough, he’ll then be able to behave properly. By going through our buying guide and the list of the best retractable dog leashes on the market, you can certainly choose one that can perfectly suit your dog.